The Darren Weir trained Wolfendale will return to the Apple Isle chasing a hat trick of wins when he lines up in the Listed $150,000 Schweppes Tasmanian Derby (2200m) at Hobart on Friday. Civil Disobedience, above, will join stablemate Wolfendale in the Tasmanian Derby at Hobart. Photo by Ultimate Racing Photos. Wolfendale’s winning run started when he got the judge’s decision by a nose in a 2025m BenchMark 64 Handicap on a heavy track at Cranbourne on January 12 followed by a win in the Listed $100,000 Kevin Sharkie Hobart Guineas (2100m) at Hobart on January 28. Weir’s Warrnambool foreman Jarrod McLean said that Wolfendale put in a solid staying performance to win the Hobart Guineas with Dean Yendall in the saddle and is keen to see him return to Hobart for the Tasmanian Derby. 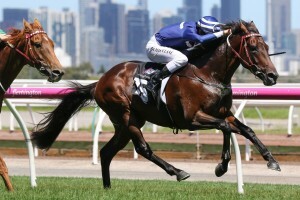 “He was particularly well ridden by Dean,” McLean told Tasracing’s News. “He was able to get out, and he outstayed them on the line. “He’ll go home but he’ll come back across with Civil Disobedience on Friday week. Yendal gets the mount again on Wolfendale who drew barrier three in the seven horse Tasmanian Derby field while his stablemate Civil Disobedience will jump from the inside gate with John Allen on board. Civil Disobedience was a Flemington winner two starts back in a 2000m BenchMark 70 Handicap on January 1 before finishing third in similar class over the same course and distance on January 28. The Hobart Guineas first four placegetters will clash again in the Tasmanian Derby with the runner up Double You Tee drawing the outside barrier in the seven horse field with Jason Maskiell taking the mount again. Third placegetter Pennstock with regular rider Craig Newitt in the saddle again has drawn nicely at barrier two while Hobart Guineas fourth placing Overplay will jump from gate four for apprentice Chris Graham. Longford trainer John Blacker was happy with the effort of Double You Tee in the Hobart Guineas and is looking forward to the re-match with Wolfendale. “He ran super. The tempo slackened up going past the 1200m mark, and we thought we might’ve been two pairs closer,” Blacker said. “From barrier rise to that point, he wasn’t, he got back to last. He got to the line pretty good. “I thought he was home, but we just travelled a bit wide on the home corner, with the rail out.